AKA Claude Elwood Shannon, Jr.
American mathematician Claude Shannon defined the basics of how modern computers work, before there were any modern computers. As a boy he designed and built a working model airplane and a telegraph system that connected his bedroom to a friend's bedroom half a mile away. In adolescence he ran a fix-it shop in a back room at a local drug store. As a young man he studied under Norbert Wiener and, fascinated by George Boole's Laws of Thought, he showed in his Master's thesis how Boolean algebra could be applied in computer circuitry by organizing data as a series of simple yes/no switches. Now called the Magna Carta of the information age, it was an idea no-one had previously proposed. He calculated the maximum volume, or "channel capacity" in binary digits (or "bits", a term coined by Shannon) per second, of communication transmission over finite media, first over telephone lines, later in optical communications, and still later in wireless communications. His landmark 1949 paper on cryptology changed the way highly-secure messages are coded, based on his theory that messages could be made virtually undecipherable if sufficient "redundancy" (extra bits) were added. 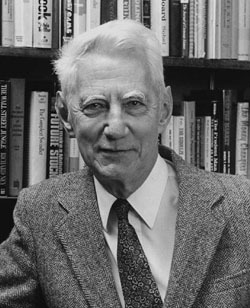 He defined entropy as a measure of any communications system's efficiency, proposed programming a computer to play chess, described how a universal Turing machine could be designed with only two states, and wrote several important papers on various aspects of communication theory, cryptography, and information theory. Early in his career he worked alongside Vannevar Bush adjusting the gears and pulleys of the differential analyzer, Bush's pioneering mechanical computer. Some of Shannon's more groundbreaking ideas were grasped only by a few scientists, and could not be practically pursued until the arrival of solid-state electronics and integrated circuits. In a long career at MIT, Shannon was the embodiment of the school's "eccentric genius" stereotype. He was known for traversing the university, indoor and outdoor, on his unicycle, and for his own amusement he designed and built such contraptions as a motorized pogo stick, a calculator that took input and gave answers only in Roman numerals, and numerous fully functional three-ball juggling machines. Based on a suggestion from Marvin Minsky, he built a working "ultimate machine" — a box with a switch that, when switched on, powered a mechanical hand that emerged from the box to switch the switch back off, then withdrew into the box as the mechanism powered down. He was a distant cousin of Thomas Edison.